Cheesy Lahvosh Dippers - A recipe from Savor California, the online showcase for extraordinary gourmet foods and beverages from California. 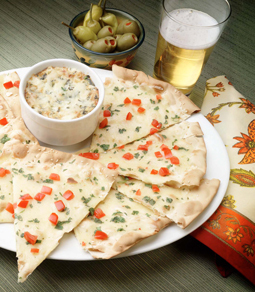 Houlihan's Restaurants serve their Hot Spinach and Artichoke Dip with these Dippers. Sprinkle grated pepper jack cheese on the 15" Valley Lahvosh Crackerbread. Cut into wedges and sprinkle with tomato pieces. Serve with hot spinach and artichoke dip.